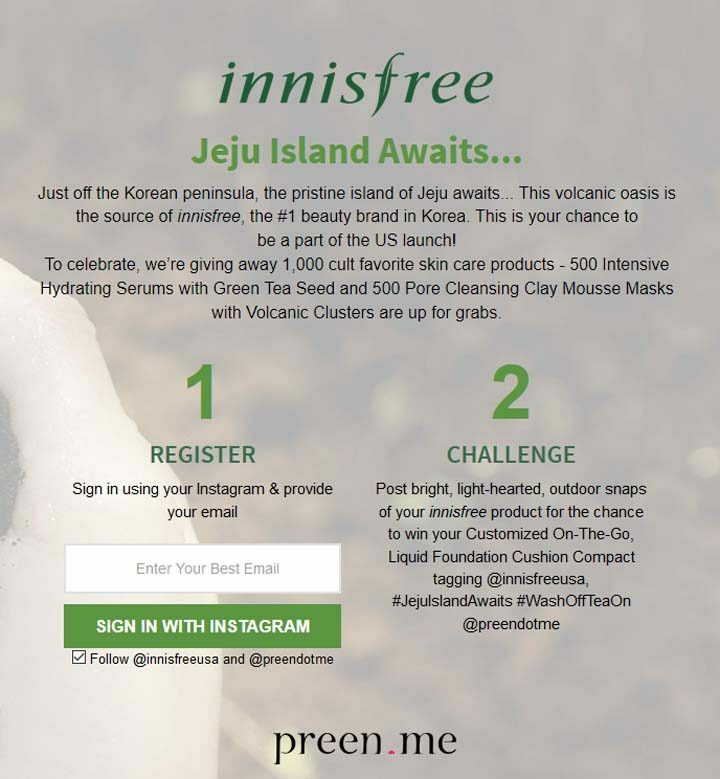 The innisfree #JejuIslandAwaits Challenge is open to participants who are legal residents of the United States (excluding Puerto Rico) who have attained the age of 18 or older. The innisfree #JejuIslandAwaits Challenge ends on November 15 at 11:59 p.m. (Pacific Daylight time). Each product prize winner will receive one (1) of five hundred (500) innisfree Intensive Hydrating Serums with Green Tea Seed each having a retail value of approximately $25 USD or one (1) of five hundred (500 ) innisfree Pore Cleansing Clay Mousse Mask with Volcanic Clusters, each having a retail value of approximately $19 USD. Each Grand Prize Winner will receive one (1) of thirty (30) innisfree Customized On-The-Go, Liquid Foundation Cushion Compacts, each having a retail value of approximately $26 USD. The total retail dollar value of the prizes available in this Program is approximately $22,780 USD.